An aluminum fence could be exactly what your yard needs! Are you considering buying a fence around your yard? A fence can provide a homeowner with numerous benefits, such as privacy and security. 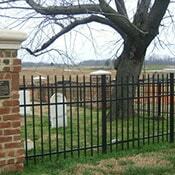 Did you know that are many types of fences available today? A few popular options include your traditional picket fence, chain-link, and aluminum. It is essential to determine your needs before selecting a fence material. Here are are a just a few of the advantages of buying an aluminum fence. When you choose a metal fence, you are selecting a strong and reliable option. When compared to other fence materials, like wood, you won’t need to worry about weather nearly as much. Aluminum can withstand some of the harshest weather conditions. Generally speaking, metal fences are incredibly durable and long lasting. If you decide to invest in an aluminum fence, you are choosing to invest in a fence that is built to last. When you compare aluminum to other fence options on the market, it is a low-maintenance option. If you choose a standard wood fence for your yard, you may need to worry about restaining or repainting it after so many years. Also, you are less likely to need to replace sections of your fence or need to do repairs as often. Price is always going to be a primary concern when you are looking to invest a fence. If your property is large and you are on a budget, aluminum is a great choice. Aluminum fences can be an aesthetically pleasing addition to your yard. It comes in a variety of styles and colors that can complement the appearance of your home and property. This entry was posted on Friday, January 19th, 2018 at 11:32 am. Both comments and pings are currently closed.